WASHINGTON, Oct 22 2013 (IPS) - The U.S. government has been engaged in unlawful drone strikes in Pakistan that are in violation of international law, and may amount to war crimes, according to a new report released here by Amnesty International on Tuesday. The report’s release comes at a critical time, as newly-elect Pakistani Prime Minister Nawaz Sharif returns to Washington for his first official visit as the country’s leader since 1999. In the report, “Will I Be Next? 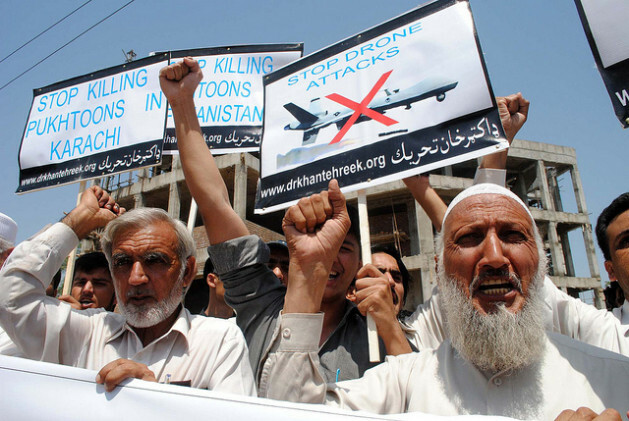 U.S. Drone Strikes in Pakistan,” the human rights organisation provides evidence that U.S. drones have killed innocent civilians that posed no apparent threat to the United States. Amnesty’s report notes that in nine strikes carried out between May 2012 and July 2013, at least 29 unarmed civilians lost their lives, including a 68-year-old woman who was killed instantly by two U.S. Hellfire missiles as she was picking vegetables. The study was released jointly with a report by Human Rights Watch, another human rights organisation, highlighting the illegality of U.S. drone strikes in Yemen. The report “Between a Drone and Al-Qaeda,” estimates that in Yemen, where the U.S. is currently engaged fighting Yemen’s Al-Qaeda wing (AQAP), dozens of civilians have been killed between 2009 and 2013 by U.S. drone strikes. Indeed, while the two human rights groups call for greater transparency by the U.S. government and for accountable investigations of unlawful killings, they are not advocating for an end of the practice itself. “Drone technology is not illegal per se, it’s just a weapon or a weapons platform. What really matters is that the U.S. government conducts any drone strike in compliance with the rules of international law,” Amnesty International’s Shah told IPS. According to Human Rights Watch, the U.S. conducted as many as six drone strikes in Yemen, five between 2012 and 2013. Two of the attacks killed civilians indiscriminately “in clear violation of the laws of war,” and the other four strikes targeted individuals who were not legitimate military objectives. In a speech delivered last May, Obama vowed to increase his administration’s transparency on the issue of drone strikes, shortly after three U.S. citizens were reportedly killed during a drone operation. However, critics and human rights activists claim that President Obama has fallen far short of this pledge. “The U.S. government continues to operate in complete and utter secrecy over its drone policy, so we still don’t know whether the government’s actions amount to war crimes,” Mustafa Qadri, Amnesty International’s Pakistan researcher, said at the report’s launch here on Tuesday. The Central Intelligence Agency (CIA) had no comment when contacted by IPS, referring press inquiries on the matter to the White House. At a briefing Tuesday, White House spokesman Jay Carney defended the U.S. government’s drone policy. “We take the matter of civilian casualties enormously seriously and the actions we take are mindful of the absolute need to limit civilian casualties,” Carney said. So far, the two human rights organisations have been cautious and have not labeled U.S. practice a war crime. Part of the reason is the lack of detailed information. “We’re still not 100 percent sure that the strikes amount to war crimes. So what we’re doing is we’re calling on the Obama administration to come forward and demonstrate that we’re wrong,” Human Rights Watch’s Letta Tayler said on Tuesday. A more transparent approach, she said, would be a first step. Both groups urged the U.S. government to at least offer compensation to the relatives of the victims. But the problem, they say, is that the U.S. refuses to acknowledge the strikes. So far, the U.S. government has only acknowledged two attacks in Yemen, which involved the death of U.S. citizens. U.S. drone strikes in Pakistan have long been a contentious issue between Washington and Islamabad, and the public backlash over civilian victims may hinder U.S. efforts against Al-Qaeda insurgents in the country. Prime Minister Sharif’s visit could not have been more timely. “The drone issue is definitely going to come up during Sharif’s visit with President Obama, but it probably won’t be a major point of contention, since the two countries are trying to rebuild their ties,” Shuja Nawaz, the director of the South Asia Center at the Atlantic Council, a think tank here, told IPS. According to Nawaz, Pakistan’s prime minister is going to raise protests against U.S. drone policy, but mainly to appease his audience back home. The two governments are attempting to mend their relations after reaching an historic low-point in 2011, following the capture of Al-Qaeda leader Osama Bin Laden and the killing of 24 Pakistani soldiers by a U.S. air strike near the country’s border with Afghanistan. The White House has also recently confirmed that that it will release a 1.6-billion-dollar aid package to Pakistan, beginning in 2014. It is estimated that most of the aid will be allocated to assisting the U.S. withdrawal from Afghanistan. Sharif is scheduled to meet with President Obama on Wednesday.